Temples are some of the most visited monuments in India. As per records, millions of people go to temples every day to pay respects to their gods and goddess. However, there are several temples in India which not only provide its devotees or tourists with a composed and peaceful environment with divine aura but also let them learn a lot about the history of their respective places. Jharkhand is one of the states in India which remains ignored even during the peak season despite being home to hundreds of natural as well as historical wonders. So, how about visiting Jharkhand this season and learning a little bit about its history by exploring the beauty of its temples? From centuries-old to recently-built temples, this list includes each temple which should not be missed by any tourist or traveller. Maluti Temples in the Dumka district of Jharkhand is a must-visit destination if you are looking out for a place where you can learn a lot about the history of the region and the state. Maluti Temples is a complex of 72 terracotta temples which are said to have been constructed during the Nakar Raj in between the 17th and 19th century. Even though most of these temples are in dilapidated condition, they are still famous tourist spots due to their historical importance. All of these temples were dedicated to Lord Shiva. How about visiting Maluti Temples this season and taking a stroll through its aisles which narrate the history of its survival and existence? Situated in the Giridh district of Jharkhand, Harihar Dham is famous amongst tourists and Hindu devotees for its huge Shivalinga, which is believed to be the largest of them all in the world. It is said that it took almost 30 years to construct this monumental Shivalinga. Hence, owing to its architectural and religious significance, it is visited by thousands of local tourists and devotees every year. The major festivals celebrated here include Maha Shivaratri. One of the most revered pilgrimage centres in Jharkhand, Baidyanath is located in the Deoghar dsitrict of Jharkhand and is a must-visit destination for every traveller and tourist. It is one of the twelve jyotirlingas in India, which are considered to be the holiest abodes of Lord Shiva. It is a complex of 22 temples and is visited by thousands of pilgrims every year. How about visiting this ancient pilgrimage destination in Jharkhand and getting rid of your sins by spending some time in its beautiful sanctum? One of the most popular and frequented Hindu temples in Jharkhand, Jagannath Temple is located in Ranchi and was built during the 17th century. It is nestled atop a small hillock and overlooks the nearby settlement. The presence of beautiful green surroundings helps in maintaining the serenity and composure of the temple. Dedicated to Lord Jagannath, a form of Lord Vishnu, this alluring temple's architectural style resembles the Jagannath Temple at Puri in the state of Odisha. You must visit this ancient temple if you love exploring the rich history of any place and learning in detail about their glorious and miserable past. 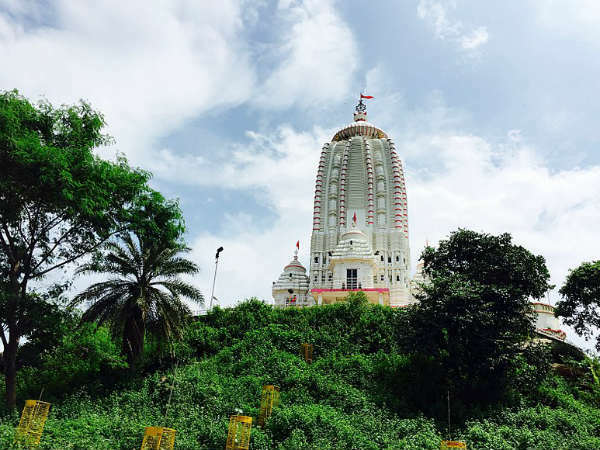 Located at Tamar in the Ranchi district of Jharkhand, Maa Dewri Temple is one of the oldest temples in the region and is dedicated to Goddess Durga. However, you can also find an idol of Lord Shiva within the compound of the temple, which is spread over an area of 2 acres. Maa Dewri Temple is also the only temple where tribal priests known as Pahans worship the goddess along with Brahmin priests. As per legends, it is believed that whoever tries to change the architecture of the temple, will certainly be punished by the gods and goddesses. How about taking a tour of Maa Dewri Temple and learning in detail about its legends and structural formation? One of the popular temples dedicated to Goddess Durga, Goddess Lakshmi and Goddess Saraswati, Bindudham or Binduwasni Mandir is located atop a hill where one of the largest statues of Lord Hanuman is also built. At the entrance of the temple, you can also find a statue of Lord Surya, the sun god. It is located in the Sahebganj district of Jharkhand and is visited by thousands of Hindu devotees during the festival of Chaitra Navaratri. Being one of the ancient temples in Jharkhand, it definitely needs to be visited and explored. Located at Bokaro and dedicated to Goddess Kali, Sri Sri Kalika Maharani Temple is one of the beautiful designed temples in Jharkhand. Even though it is a newly-built temple, it is still visited by thousands of Hindu devotees and tourists during the festive seasons. The gorgeous architecture of the temple is certainly a beauty to admire.